Mafell describes this saw and track as a cross-cutting system, a title that it deserves. I have always regarded the hand-held circular saw as a bit of a brute; indeed at one college where I taught, students were forbidden to use this machine because it was deemed too dangerous. This is not a view that I subscribed to I hasten to add, but the health & safety officer ranked higher in the principal's estimation than I did. One way of taming the saw is to attach it to a track, which is what Mafell has done, making it much more controllable and also ensuring accuracy. It can though, also be used without a guide or with the standard fence. The soleplate is marked with a pointer that is in line with the blade whether making perpendicular cuts or bevel cuts. This is achieved by making the pivot point for the body line up with the marker. It is a simple idea but one that makes the saw much easier to use; the cut will be where the pointer says it's going to be. Now wouldn't it be nice if one could say that about all power saws? The track has a non-slip rubber finish on the underside. 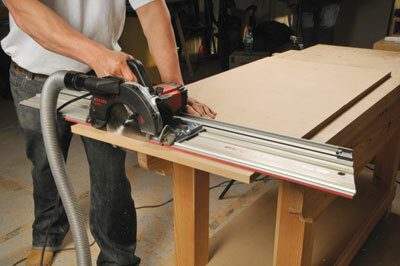 Once positioned on the material being cut it stays there, so no more fiddling with battens and cramps. The rail also has a replaceable rubber lip against which the blade runs. This helps reduce breakout. Finally, the rubber underside prevents scratch marks in fair-faced materials such as doors, faced panels and worktops. 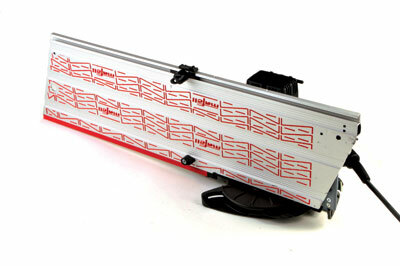 The track is fitted with stops and scales which make positioning prior to a cut very much easier. Guide rails come in different lengths, from 400mm to 3.1m, and can be joined via a clip, and there is also an angle guide which can be preset for repeat cuts. 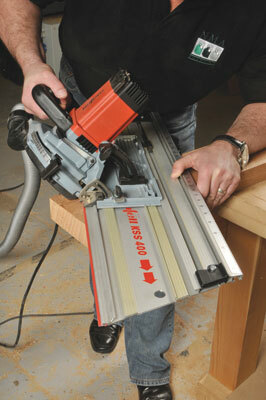 The saw has 'smart' stops that can be used to control the length of cut. If you are worried about the non-slip surface of the track moving, it can be secured with a pair of special F-cramps. This saw also has a plunge-cutting facility. This will make stopped cuts and therefore gives a safe way of cutting stropped rebates, chamfers or openings for drawers or letterboxes. At this point I should also mention that there is a KS 300. This model has no overhang on the right-hand side of the blade, making it possible to cut to within 13mm of a solid surface such as a wall or frame. My colleague Anthony Bailey liked the KS 300 so much that he has bought one. 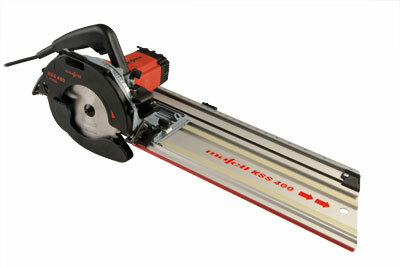 Crosscutting and ripping blades are available and the KS 300 can be fitted with a trapezoidal tooth blade for laminates. Extraction is via a 38mm O/D port and is very effective. 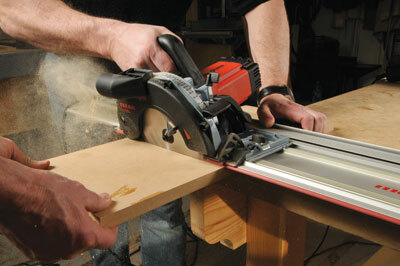 The use of a track with stops makes this a single-handed crosscutting tool. I also understand that the saw will additionallly fit Festool tracks. The KS 300 will cut closer to obstacles and offers more blades but is lower powered and has a smaller depth of cut than the KSS 400. There is no doubt that the KSS 400 and its accessories constitute a system and in the tiny workshop or on site it could do a lot of the work that is usually done by a portable tablesaw. If you make a lot of fitted furniture and go on site quite a bit this is a great tool to have whether you choose the light 300 or this, the heavier, more powerful 400 version. "The track is fitted with stops and scales which make positioning prior to a cut very much easier"